Setting: Sometimes things just go wrong. You sit down to rest, breathless with effort, and soon as not comes again the old foe. Time to move again, comforts forgotten. But haste leaves things behind, telltales of those ahead. Roll d10. 1: A half-reshaped broken saber, a grindstone. 2: A sawn-off gangrenous leg and cut tourniquet. 3: Six silken masks, crumpled. 4: Small crocken pots, each with a verdant sprout. 5: A mannequin of sackcloth and wheatstalks; paintdaub face. 6: A singed set of woodworker’s tools, within a ritual sigil. 7: Pulled-apart skeletons of cooked rats. 9: A broken circle of salt. 10: A swaddling cloth. No baby. And what if they return? 1 How do you know? Off the Queen’s Road, past the thorp of Wightrise, is an old estate across the cataract from the millroad. But what sort of estate is it? I like maps like this, because they are alive with possibility. They lend themselves to multiple types of adventures. Sometimes I wonder if less really is more: with no grid, no directions, merely a space, any GM can fit such a map into her campaign. Perhaps the archetypal use would be a simple explore and loot. GM copy, flagged with encounter areas. 1: Crossroads. The millroad leads from Wightrise up to the ford in Erran’s Run where the stream slows enough for the mill to take advantage. The overgrown path turns to the bridge leading to Erranton Estate. 2: Bridge. Built in the days when craftsmen cared for their work, this wooden bridge spans the gash that separates the road from the homestead. 3: Home. The ancestral Erranton home backs up against the woods. In former days the family lived here; now it crumbles down upon itself, pressed down by the inexorable weight of time and rain and indifference. 4: Caretaker’s Cottage. Formerly the hearth and home of the servants that managed the estate. 5: Outbuildings. A smokehouse, chicken coop, and root cellar. Located away from the main house to keep the odors down. 6: Stables. Stables and paddock. Shelter for livestock and a place to graze; tools and equipment. 7: Well. Reliable water source; center of daily life. 8: Gardens. Self-sufficiency garden for the estate. So, now we’ve got the environs. What sort of adventures can we set here? Option 1: Dungeon Crawl: The PCs have heard that the old Erranton place has been ransacked and overrun by goblins/orcs/bandits. 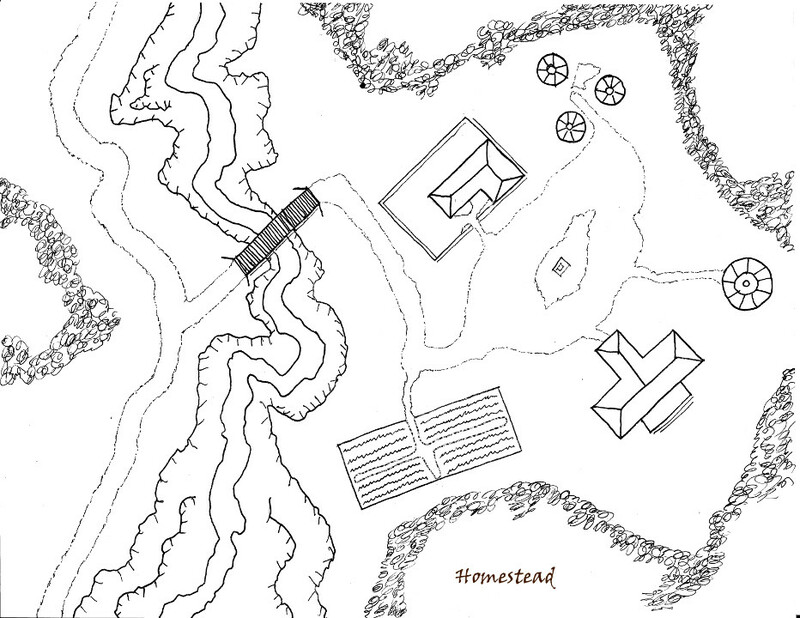 The PCs go out there, fight the monsters, explore the place, and loot it. Option 2: Reverse Dungeon: The PCs have been sent by their patron/mentor/employer to go to the Erranton Estate and negotiate to purchase something. The Errantons have the something, and are surprisingly reasonable about the transaction. The catch? At an inopportune moment someone else appears at the crossroads looking to ransack the Estate. Now the PCs have to team up with the Errantons to defend the homestead. It could be monsters being monsters, troops looking to collect back taxes, or just adventurers raiding other peoples’ homes just to steal their stuff. Can you hold the bridge? Option 3: Swords & Shadowruns: The PCs are hired by Guildmaster Johnson to assassinate the scion of the Erranton family line. Old Man Erranton is on his last legs anyway, but his son has aspirations to local power, and someone doesn’t want that. But the PCs need to be quiet and make it look like an accident. No door-kicking and fireballing. Can the PCs get in, get done, and get out? Option 4: The Returned: The old Erranton place has been avoided for years. Recently the local Order lured all the Returned into the house and burned it down around them, lighting the bridge aflame as they withdrew. But as of a month ago, the house and bridge still stand–and look just as they always have. A scarecrow stands in the field, eternally shouting something in an elder tongue. How can the PCs clear out the house for good? Why is the stableyard covered in fresh furrows? Why is there fresh meat in the root cellar? And why is that little girl standing on the lip of the well? Option 4a: The Glamour: Everyone knows the old Erranton place is haunted, a place where the dead walk and maintain a mockery of a farm. But what no one knows is that there are no dead at the homestead. How long will it take the PCs to figure out that reclusive fae have taken the place for their own, and are using magic to frighten interlopers away? And how will the PCs react when they discover that they’re the invaders, and the fae aren’t even wicked? What kind of scene would you set here? how do you sleep in the woods? Do your GM a favor. Tell her exactly how your party bivouacs when you settle down to sleep. Night tends to be downtime on an adventure. The scenes get all the attention: the time spent moving carefully through the dungeon, the set-piece encounters, even the rolls on the random encounter table. That’s when the excitement happens. Usually the party is keyed up for a fight. When was the last time your fighter fought without his armor donned, buckled, and settled? Your rogue with her keen senses and reflexes dulled by sleep—real crusty-eyed sleep, not Sleep? Your mage swinging that quarterstaff, out of spells, about 20 hours into the expected 15-minute adventuring day? The PCs don’t get a pause button. It is an impoverished campaign world that sits and waits upon their actions. The verve a GM wants to create, the feeling of a living world, of not riding a railroad, is largely contingent upon the world carrying merrily along whenever the PCs are not directly interacting with it. NPCs continue along with their business—remember, each one of them is the hero of his own narrative—when the PCs aren’t looking. Monsters don’t stop hunting for food because the PCs bedded down for the evening. Indeed, whenever you’re not looking, your enemy is out there, leveling up. So, how do you sleep in the woods? If you tell your GM, you’re a lot more likely she’ll show you why it’s important. Do you sleep on the ground, maybe in that bedroll? Okay. Think about how you felt the last time you got a poor night’s sleep. How did you function at work the next day? Were you groggy, irritable, distracted? Now imagine instead of tossing and turning in your bed, you were doing so in a threadbare bedroll, on the root-lumped rock-bestrewn ground, in the rain. And then you remember that most carnivores hunt at night. That campfire will keep you warm. It will cook your fresh food, if you were able to hunt or snare any, or heat up some water for that tea you remembered to tuck into your pack. It provides a cocoon of warmth and light, a small sphere of life in the brooding dark. The fire is seductive. And it’s even more seductive for those skulking out there in the darkness. An open campfire lets you see for a few yards around. But it can be seen for miles. Hungry eyes can see in, but after a few yards, you can’t see out. Does your party carry a tent? It will keep the rain off, but now you can’t see out. As any child who has ever cowered under a blanket can tell you, that bit of cloth can feel like armor against evil, but any real evil knows that canvas is rent as easily as the flesh within it. And how are you toting that heavy canvas tent around, anyway? Did you take skill levels in muleskinning? And you thought your cloak got heavy when it’s wet out. When all else fails, ask your ranger. Any ranger worth his salt will at least be able tell the natural lines of drift that unwelcome evening friends will tend to travel, set up a lean-to to keep off the rain, and dig a little firehole where the light won’t give you away. Your druid will probably just be curled up in the pine duff under an outcropping anyway. Tell your GM how you bed down at night. She might be kind enough to send you some visitors. And hope your third watch didn’t close his heavy-lidded eyes, just for a moment.